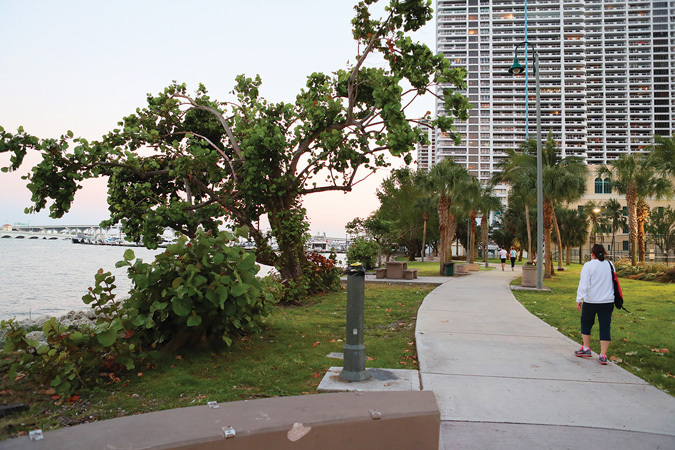 New projects adorn Biscayne Bay at Edgewater. As six developments take a step toward completion, some locals wonder when more goods and services will also follow the real estate boom into the area. νAria on the Bay at 1770 N Bayshore Dr. is to begin closings in the next 30 to 45 days. Nicolás Bárbara, the sales director for the condo at Cervera Real Estate, says 90% of the 648 units are sold, including four commercial spaces. Regular units range from 813 to 2,362 square feet. Developer Melo Group hopes to sell the remaining 70 units this year. Price tags dip as low as $400,000 for one bedrooms and rise to $1.8 million for three bedrooms. νLuxury condo Elysee at 788 NE 23rd St. offers 100 units, 50 of which are sold. Two Roads Development plans to complete the project in 2019. The three- to five-bedroom units spread across 57 floors, start at $1.5 million. νModera Edgewater 25, currently undergoing construction at 455 NE 24th St., offers 297 units spread across eight stories accompanied by a 417-vehicle garage. νParaiso District features several luxury condo buildings, Paraiso Bayviews, Paraiso Bay, One Paraiso and Gran Paraiso, and Paraiso Bay Homes, eight townhomes at 600 NE 31st St. Paraiso Bayviews offers 345 units, 13 of which are still on the market. Paraiso Bay consists of 317 units, all sold. One Paraiso sold the remaining 276 units within the past 45 days. Gran Paraiso offers 317 units with fewer than 30 remaining. Listing prices range from $600,000 for a one-bedroom with a den to a unit with four bedrooms at $1.6 million. One of the eight townhomes of Paraiso Bay Homes remains available. The homes face the water, Michael Schwartz’s Amara restaurant, and a soon-to-debut public park. The park will replace the current sales office on site. Newly completed projects experience continued interest. Karen Elmir, CEO of Elmir Group with Cervera Real Estate, sees such attention at Biscayne Beach Residences. The condo building sits at 2900 NE Seventh Ave. All the resale units range from $400,000 for a one-bedroom to $2.5 million for four bedrooms; the two penthouses, providing two floors, a private elevator and a pool, sell for $9.4 million and $10.5 million for over 10,000 square feet. She says one big draw is the location central to the trendier neighborhoods and the access to the MacArthur Causeway. Despite an injection of new real estate projects, neighborhood attention often shifts to the lack of goods and services. One proposed addition includes a bayfront walkway. Mr. Rosso continues to push for such a vision with the Biscayne Line project, spanning Northeast 36th Street to Museum Park. Commissioner Ken Russell supports the plan. In a statement, Mr. Russell wrote: “I sponsored an ordinance that would allow the city to obtain an easement and construct the Baywalk in advance of any redevelopment on these properties, and to obtain a reimbursement from the property owner when the land is redeveloped in the future.” The city commission didn’t approve his offering, but Mr. Russell said he hopes to propose more legislation on the matter. Besides a Baywalk, Madeleine Romanello, broker associate at Compass, says the area also needs large workspaces, another supermarket and a public school that can sustain the area’s current growth. Only a Chimpanzee could think of stealing the privacy of some buildings will increase its value to the owners. I would love to see a sidewalk running inside these peoples’ (proposing such change) back yard to check how value and privacy will increase. Its scary how the greed from government officials are ruining the city. If you want to make it better, make more parks within the neighborhood, not the jungle of buildings everywhere, without clean air, as the most of trees and little areas had been decreasing. Fix the roads, there are cracks and potholes everywhere, clean the streets. Create some sense of righteousness, for GOD’s sake, you won’t live forever, let’s start to be civilized and put the greed aside for once!